To merde or not to merde, that is the question. Did General Cambronne say it, or did he utter "The Guard dies but never surrenders", or was he as this book says lying unconscious on the ground? This book is large at roughly 500 pages, and it is jam packed with first person accounts of the battle. What makes this book different from so many others is that these accounts do not gel at all with the history as we have been told until now. We have been taught through word and screen that the Old Guard was destroyed by English troops. The author shows more than just a few accounts that say the Old Guard was actually destroyed by the Prussians. Another 'myth' the book tries to do away with is why the French attack was so delayed. We have been taught it was because of the condition of the ground that morning. There are many accounts and the author shows us that the French were just not ready to attack early. 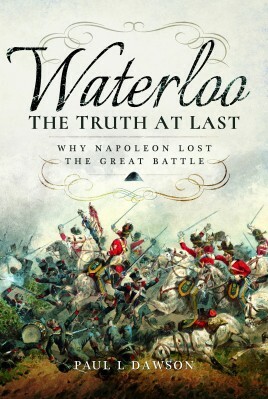 The author also questions if this army was one of the better ones that Napoleon commanded. This has been put forth in many written accounts of the battle. Mr. Dawson backs up his assertions with a lot, and I mean a lot, of facts and figures. The book can stand on all of the points the author shows that can be backed up by figures etc. The only problem with these first hand accounts is what if they are not correct, or are remembered incorrectly? This book is one that everyone should have in their library, whether they agree with all of its findings or not. It is good to have a book that makes us question what we have believed in for the past two hundred years. The only thing I can fault the book for is a total absence of maps. A map to show where the author believes the Old Guard was destroyed/surrendered would have helped the reader to understand what exactly, and how much, the author was trying to correct the historical record. Even with the lack of maps, it is still a great book for a reader to ponder over. Do yourself a favor and read the author's other books on the campaign.